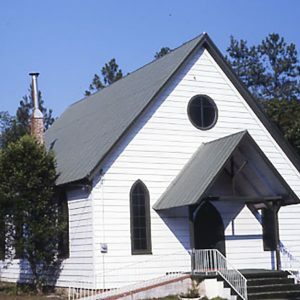 This church was constructed in 1893. It is a simple wood frame building displaying elements of the Gothic Revival style. In the 1870s Bishop William Bell White Howe established missions for African Americans in the Columbia and Charleston areas. He appointed Rev. Thomas Boston Clarkson to minister to residents of Lower Richland County. Rev. Clarkson oversaw the construction of a chapel near Eastover on the site of the present church. The chapel was built with funds donated by Rev. James Saul of Philadelphia and named in his honor. Rev. Clarkson served as minister of Saul Chapel until his death in 1889.